(from page 2 of the 2007 Collection) 2007 Grabber Orange Saleen Mustang Parnelli Jones limited edition. Only 500 were made. All were Grabber Orange and coupes. They have a 302ci 3-valve v8 engine, 302 side stripes, shaker hood, race-style hood pins, rear window louvers, 1970 model replica race wings, and billet gas cap. (from page 2 of the 2007 Collection) 2007 Grabber Orange Saleen Mustang right front view showing black 302 side stripes. (from page 2 of the 2007 Collection) 2007 Grabber Orange Saleen Mustang front end view showing shaker hood and race-style hood pins. 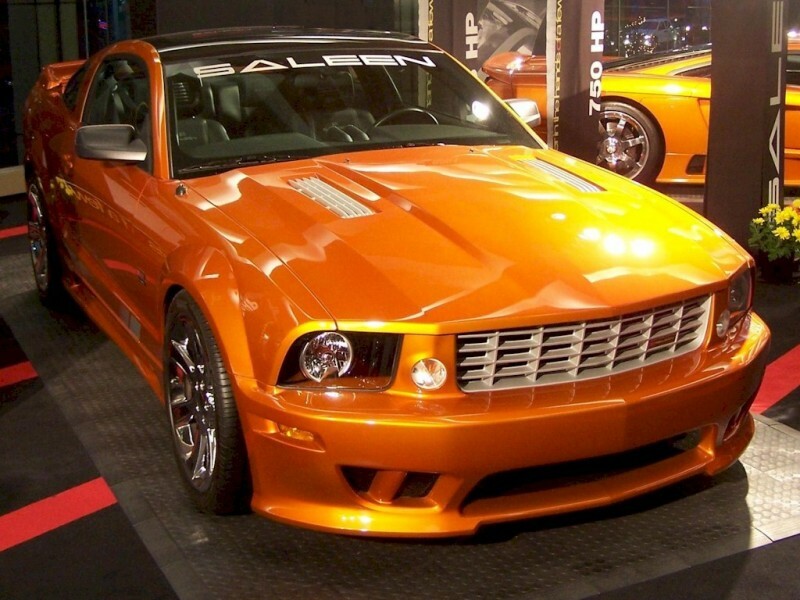 (from page 2 of the 2007 Collection) 2007 Grabber Orange Saleen Mustang left front view. (from page 4 of the 2007 Collection) Black Mustang Saleen S-281-SC with a supercharged 4.6L V8 engine and custom powder coated black wheels. (from page 4 of the 2007 Collection) Black Mustang Saleen S281-SC showing custom window lettering. (from page 4 of the 2007 Collection) Black Mustang Saleen S-281-S/C showing Saleen rear spoiler, silver stripes, custom black powder coated wheels, and Saleen dual exhausts. (from page 4 of the 2007 Collection) Black Mustang Saleen S281-SC, front end view. (from page 5 of the 2007 Collection) Redfire 2007 Saleen S281 Supercharged V8 with Saleen chrome wheels. (from page 5 of the 2007 Collection) 2007 Saleen S281 Supercharged V8 showing Saleen chrome wheel option and Saleen body color racing quarter window panel option. (from page 5 of the 2007 Collection) 2007 Saleen S281 Supercharged V8 showing Saleen designed rear spoiler with endcaps, rear wing (recessed tail lights), and 2 1/2 inch center exhaust. (from page 5 of the 2007 Collection) 2007 Satin Silver Mustang S281 Supercharged V8 Saleen with Saleen chrome forged 5-spoke wheel and tire upgrade($3199), 3.73 rear gear ratio upgrade($551), and body color racing quarter window panel($460). The Saleen design body includes injection molded rear and front fascias, side skirts, and door cladding; front grille, integrated front turn signals, quarter window trim, center body rear panels, hood with heat ventilation, rear spoiler and end caps, rear wing. (from page 5 of the 2007 Collection) 2007 Satin Silver Mustang S281SC Saleen left front view. This Saleen has its 443 serial number on its bumper. (from page 5 of the 2007 Collection) 2007 Satin Silver Mustang S218 supercharged V8 Saleen with standard racecraft suspension which includes Saleen specific linear rate front and rear springs, front struts, rear shocks, front sway bar and pivot bushings, high performance Dunlop tires (275/35Z/R20 front and rear), seven spoke alloy wheels (20 inch by 9 inch front and rear), tire pressure monitoring system, and 14" brake system. (from page 5 of the 2007 Collection) 2007 Satin Silver Mustang SC281SC Saleen left rear view. (from page 5 of the 2007 Collection) 2007 Satin Silver Mustang S281SC Saleen rear end view showing its dual Saleen 2.5" performance center exhaust. (from page 8 of the 2007 Collection) Beryllium 2007 Mustang Saleen S281 Extreme coupe with Saleen chrome alloy wheels; a 550hp (at 6100rpm), 4.6 liter, 3 valve, supercharged V8 engine, and a Saleen serial number of 02 as painted on the left front bumper. This Mustang Saleen was the Attitude Of The Week for December 12, 2007. This photo is available in three wallpaper sizes; 800-600 wallpaper, 1024-768 wallpaper, and 2048-1536 wallpaper. (from page 9 of the 2007 Collection) Beryllium 2007 Mustang Saleen S281 Extreme coupe, front right view. This photo is available in two wallpaper sizes; 800-600 wallpaper and 1024-768 wallpaper. (from page 9 of the 2007 Collection) Low right front view of a Beryllium 2007 Mustang Saleen S281 Extreme coupe.